Many birds lately I might add one too. No, no! Not the bee! We need all the bees we can get. All the honey bees are dying from a deadly mite so it's up to wasps, solitary bees and bumble bees to do all the pollinating. We're totally screwed without them. I love your bird. 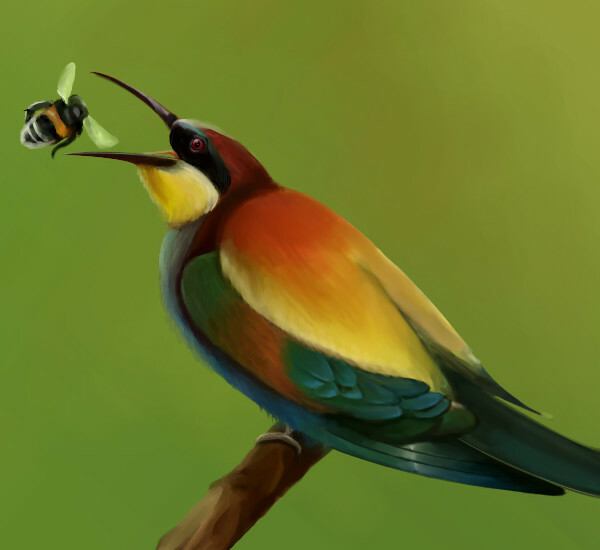 @fire, it is a Hungarian bee eater, if you google that bird in the images section, this picture will probably be on the 1st or second page. @Teapot, thank you :), I don't know if European bees are in trouble as well. But I love bumble bees. With their big white behinds, they also do a great job pollinating my blackberry bush. Well, taking away the pollen, what they do after that, I don't know. I wonder if he has evolved to be so colourful so that the bees are attracted to him like a big pretty flower. I think you are making a big point there! Wildlife works in mysterious ways. What a great subject! Very cool the way the bird is about to have some lunch. Great colors and a interesting bird too. I love the colors on this bird and I love how the piece as a whole is smoooooth! Nice work enjoy! !